Available in Cherry Lacquer, Black Lacquer and Walnut Lacquer. This famed speaker, now dubbed the Cornwall III, is back and better than ever. 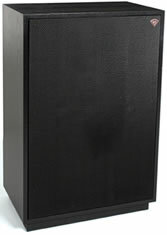 A three-way design using horn-loaded compression drivers for the midrange and treble and a direct-radiating 15-inch woofer for the low frequencies, the Cornwall delivers the full-range bass response of the Klipschorn with sensitivity and output approaching the fully horn-loaded models.